Justin Liszanckie in the hospital after the crash. Photo: Liszanckie’s mother. But all in all, he feels somewhat lucky to have avoided any surgeries. “Once I was out, I made sure I had follow up appointments…mostly I was concerned about the facial fractures around my eye.” Again, he was lucky. His eye is okay. But something else happened in the hospital he hadn’t anticipated. He got a traffic citation for $238. The police never came to the hospital to interview him. The ticket is based on the testimony of a driver who was waiting to cross, the driver of the vehicle that struck Liszanckie, and her passenger. I’ve been a daily cyclist in SF for about eight years and was recently severely injured when a car ran me over at 4th & Brannan. I spent 10 days in SF General and am in the midst of three months on disability, yet shockingly the police cited me…despite numerous inconsistencies from those involved/witnesses, clear driver negligence, and the basic laws of physics. The officer also showed a shocking lack of interest in trying to obtain additional evidence such as video footage which was mentioned in the police report but never sought out. I would obviously love to help bring more pressure on the SFPD to rectify the anti-cyclist bias that I and countless others have felt in the last decade, especially as ridership has exploded. Liszanckie sent a copy of the collision report to Streetsblog. The driver of the car that hit him, according to the report, said she “never saw the bicyclist until her vehicle made contact with him.” The officer cited Liszanckie for crossing the yellow line, but it’s difficult to see how he reached that conclusion. Remember, the policeman didn’t see the crash. The only witnesses he spoke to were the driver who hit Liszanckie, the passenger, and a neutral witness in another car. The driver said she didn’t see him until she hit him. The passenger also wasn’t looking. Going through the report, Streetsblog can only conclude the following: Liszanckie was hovering in the intersection, waiting to make his left turn. The SUV either pushed the yellow or blew through a recently turned but solid red light as he started his turn. Furthermore, if the police report of her testimony is correct, the driver of the SUV could not have been paying full attention to the road. And yes, Liszanckie had an operating headlight. “We don’t exactly know what happened. Our big beef with a case like this is the officer. 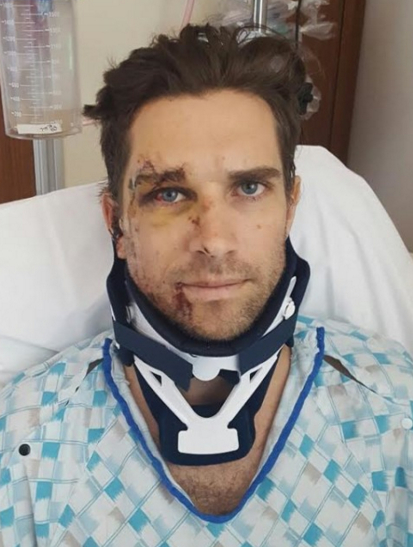 Officers typically are very black and white and simplistic about how a collision happens,” said Michael Stephenson, an attorney with Bay Area Bicycle Law, who is helping Liszanckie with the case. As he puts it, collisions usually are caused by two people fouling up. 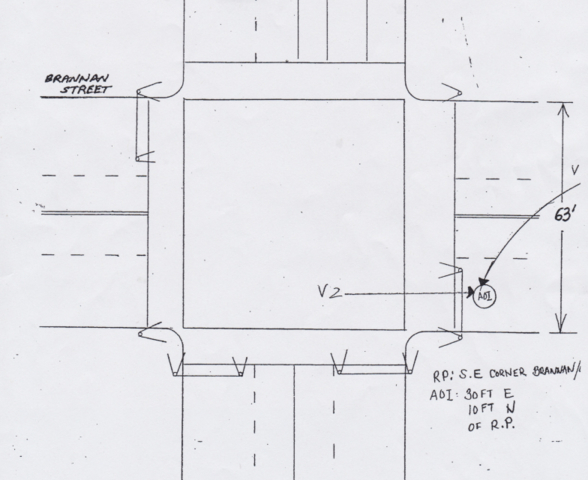 This is the actual diagram from the police report of Liszanckie’s collision. Yet the same report confirms he landed in the crosswalk after the collision. Image: SFPD. 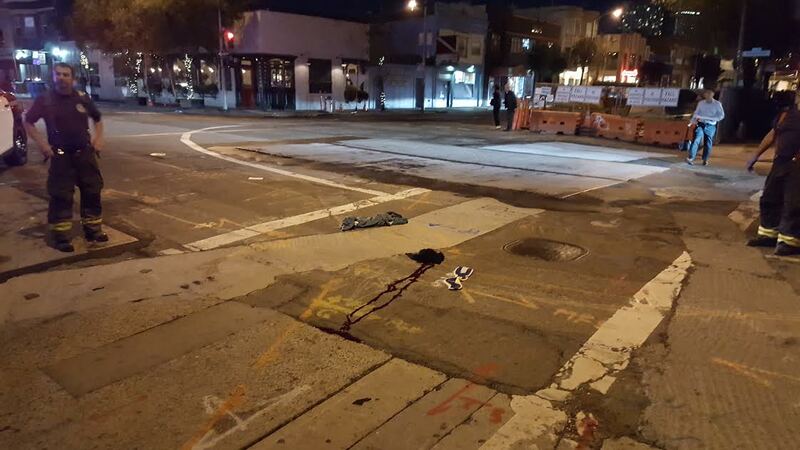 That’s Justin’s blood in the center of the crosswalk. But the police diagram shows him getting struck well to the right of here. Photo: SFPD. Stephenson said police officers are often responding to ten or more collisions a day, in addition to their usual duties. As a result, investigations get rushed. Nobody questions more than one or two witnesses. In the case of car-on-cyclist collisions, the driver of the car is usually unharmed. The cyclists, if they survive, are usually discombobulated and in agony, or unconscious. Often, the driver will collect contact information from witnesses–but only those that are favorable to the driver’s version of what happened. Those witnesses then end up in court. Furthermore, “unless you’ve got video or a witness who decides to come forward, usually the officer is only talking to someone who is blaming the cyclist–mainly, the driver,” said Stephenson. Streetsblog reached out to the San Francisco Bicycle Coalition to find out if this sounds typical for how the SFPD handles car-versus-bicycle collisions. But it took some very heavy lifting by Claymore and some dedicated advocates and public servants, including a police captain. “SFBC put me in touch with D1 Supervisor Eric Mar who contacted the captain of the Richmond Police Station (then it was Captain Silverman),” said Claymore. “The Captain then rode the route I took, and asked the ticketing officer to dismiss the citation he issued me as the Captain did not believe I was to blame. The officer refused.” That was eventually resolved in court. And, sadly, who can forget the case of Amelie Le Moullac, who was killed by a truck that ran her over in the bike lane. Advocates, not the police, had to find the surveillance video in that case too. So where does this leave cyclists? It’s a pretty grim situation that screams that cyclists simply must have video cameras lashed onto their bikes and helmets. Depending on luck isn’t a good strategy. Streetsblog readers will recall the case of Tim Doyle, who was riding in the bike lane when an SFPD cruiser jinked into it, putting him in the hospital. 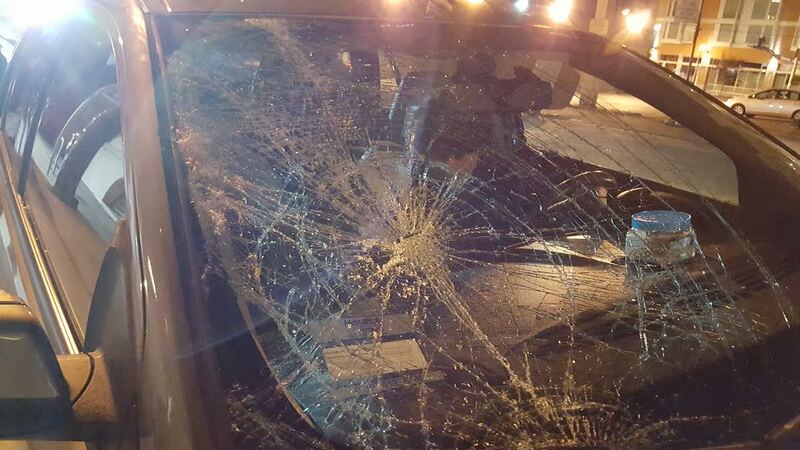 Imagine how that would have played out if not for a good Samaritan motorist with a dash cam? Stephenson also recommends that cyclists, if they are hit, make sure to collect and save evidence. He remembers a case where a cyclist was about to throw out a jacket from a crash. But that jacket turned out to be a key piece of evidence in winning a case against a motorist who claimed the cyclist suddenly swerved out of the bike lane and into his path. “We found the smallest little spec of paint on the client’s left elbow of his jacket, from his landing on the bike lane paint,” said Stephenson. That proved the cyclist was in the bike lane and the car had swerved into him, not the other way around. Stephenson also recommends that cyclist don’t have any expectation that the police are going to do a complete investigation. To the extent that an injured cyclist is able, get names of all witnesses. Or call a loved one or a friend and ask them to do it. His biggest policy recommendation is to change the expectations when police investigate crashes. Police should be encouraged to write “I don’t think I have enough facts to render a conclusion,” he said, when they are investigating a crash. If the three witnesses were telling the same story, which is what the article says is the case, then that testimony is prima facie credible even if, at trial, it turns out to be not provable. That is not what the article says, nor does the police report. All accounts offering conflicting stories. But the driver put themselves in a “difficult situation” by that very same person using poor judgment. If the judgment was sound, they wouldn’t have had to use skills to get out of a difficult situation. The article indicates that the citation is based on what the only three witnesses said. We cannot know if they were mistaken or not but, if you don’t have three other witnesses saying something different, then there is a credibility gap here. I think you should fight the citation anyway, and I suspect that it will be dismissed given that you are a sympathetic defendant. Even if you did make an illegal turn against a stop light, as the article says, then you have probably suffered enough, at least in the mind of this potential juror. Unfortunately there is a widespread perception that cyclists consider themselves above the law, and you may be suffering unduly as a result of that. The advanced police driving course, which I have taken, teaches defensive driving, meaning taking a conservative approach and avoiding getting into such situations in the first place. That said, we all end up in higher risk situations from time to time, and being able to handle them is a valuable skill. If a driver cannot see you at night, then his ability to take avoiding action can save your life. Anticipation is a key skill, but so is damage limitation. You need both to minimize accidents. The article indicates that the police drew conclusions based only on what three witnesses said, but nowhere does it state that all three told the same story, because they didn’t. The article also does not say I made an illegal turn against a red light. It says what’s most likely is that the car ran a red light, not me. I don’t disagree with wanting both, but in the situation we’re discussing, it’s clear that the driver was at fault for creating the situation in the fist place, do you not agree? Yeah, sad that bicyclists have to be so defensive. But this issue is not unique to bicyclists. In some other countries (Russia and Taiwan for example) dashboard cameras are commonplace. I asked a colleague why and he said that no-one can rely on the police to collect evidence. So the next best thing is to buy a $30 dashcam. I guess the difference in the USA is that the police generally do a much more thorough crash investigation. But the effort is linked to the perceived damage to motorists and some police officers aren’t very interested in protecting the interest of bicyclists. I’m sure a large percentage of police do investigate bike involved wrecks thoroughly but there does seem to be somewhat of a windshield bias. I’ll gladly allow anyone to plagiarize the above rough design. 🙂 One key shortcut would be to find a preexisting low power firmware controllable chip that already implements the basic video loop functionality (a dashcam!) and enhance that existing design with the motion sensor capabilities. RichLL…can’t live with him, can’t live without him! Justin, seriously, you’ve got enough legit battles ahead. Don’t waste your time or energy fighting gaslighting trolls. Good luck! @p_chazz – @RoyTT got himself banned from a lot of places, @RichLL will follow if we ever get more than a skeleton crew moderating this site. 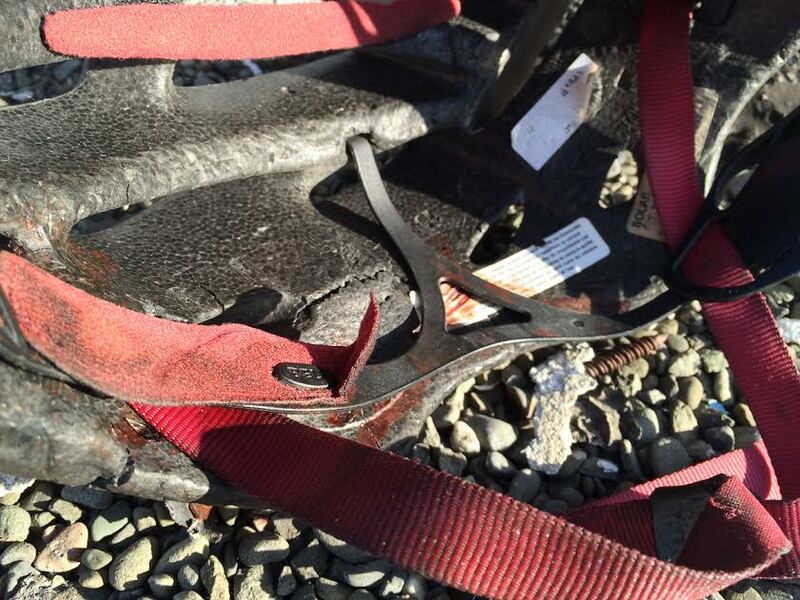 @Raven Luna Tikke – All the more reason not to be going at least 45mph, then. What has RichLL ever done that is ban worthy? He is polite and always presents logical arguments. The only problem is that they run contrary to the views of the mutual admiration society that predominates here. The problem is that he responds to EVERY single comment, on and on and on and on. Anyone going 45 over that intersection would lose a tire. You did that bit I said about the lack of uniform surface, yes? When I said that, I meant that there are gouges in the road. There were some just beyond the intersection on Brannan, across the whole street, in line with the B of A that were at least 4″ deep. But then if you were actually been to the intersection, you’d know that. “As he puts it, collisions usually are caused by two people fouling up. I read that as saying that there is evidence that both parties were at fault. chazz, if I didn’t exist, Murph would have to invent me. At the very least everyone wants to do “it” with you now, so I hope that feels good!! @p_chazz – There is nothing polite about endless off-topic responses to anything and everything, no matter how “logical” the irrelevancy is. Your sneers about a “mutual admiration society” miss the point, some of us do have a basis for understanding issues of transportation and land use, and that’s what we wish to discuss. Intelligently. @Raven Luna Tikke – I were actually been to the intersection, as you put it. I was referring to the eyewitness statement about the SUV’s estimated speed, which itself mentions the construction there. It’s up there in the article, in case you missed it. That is as may be, but when people of a similar mind set discuss matters it tends to become something of a closed loop. It’s good to have someone to challenge one’s cherished opinions. @p_chazz – Don’t need a lecture in the blitheringly obvious, thanks. Your pal has contributed nothing of any substance whatsoever to these discussions. Says Jym, the hall-monitor bicyclist shill. That’s what’s blithering obvious. So basically, you want the driver testimony to be taken at face value. Nothing could be more obviously self-serving and dishonest. You’re even worse than RichLL – at least he makes an effort half the time. Your contributions are nothing more than content-free name calling. I suspect those “accident forgiveness” policies probably have higher rates to start with, to allow them to absorb the cost of paying out for the first accident. A Card carrying member of the mutual admiration society has spoken. Hark. Nice personal attack. Do you have anyting of substance to offer or no? Not at all. I was merely suggesting that the kind of people who hang around at the scene of an accident may possibly have an agenda. That was a reply to Jym, who was attacking p-chazz and RichLL. He’s edited his comment since original posting. The sanctimonious, know-more-than-everyone else attitude has become increasingly pervasive on streetsblog. That’s all. I feel sure that Jym is sincere and passionate. But part of being a mature participant in political dialog is losing the idea that you’re always right and, instead, embracing diversity. I really hope that Jym can demonstrate that. Yep, another insult, no content. You mean, like the driver who might have an agenda to avoid fines and possibly jail time? Yep, we have to avoid taking statements from people who might possibly be biased. Therefore, the police should never interview the driver. Good to know our very well paid police force is out there working hard for all san franciscans before heading home to their suburban homes. By all accounts I am lucky to be alive.